I finally got to pick up the crochet needle again and I'm so excited about it. The only thing is that I have to learn when to put it down. I have the same trouble when I'm into a great book. I just can't stop myself—I want to get to the last stitch, the last sentence. 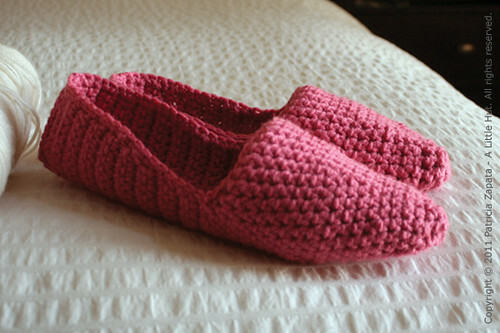 I made these slippers that are on the cover of a book I just ordered, Simple Crochet by Erika Knight (more photos on my Flickr page). They're really comfortable and warm. My little C has already requested a pair. I told her I'd be happy to make her one as soon as finished mine—because I have to figure out how to make them in her size. I think I'll be able to pull that off. I want to make almost every project in the book. It falls within the same style of the Natural Nursery book (by Ms. Knight as well). The photography alone makes every project very enticing. I'd say it's not a book for someone looking for a crocheting challenge. It's more of a book for someone that's either starting out or that enjoys very simple design, wants to make something pretty and to relax while making it. I fall in the latter category and it's perfect for me. My next non-paper project is going to be more of a challenge. Little C has requested a doll and it's not going to be an easy one. I also ordered Wee Wonderfuls: 24 Dolls to Sew and Love by Hillary Lang and she wants one of the dolls in that book. But before I tackle that, I'm going to do a little surgery on a doll I made when C was 2 (also inspired by Hillary's work). Her hair is all over the place and just needs to be fixed and trimmed. 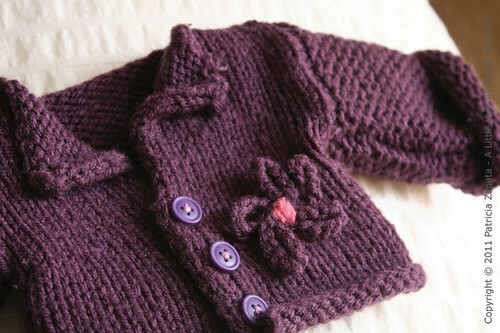 The sweater that I made for that doll is still my favorite part of that project. Ordering this sewing book comes totally from my love of dolls as a child (I played with them until I was about 12!) and seeing the same feelings in my daughter. The sewing part of this will definitely not be as relaxing as crocheting or knitting. Gulp. I think the feeling of warmer weather has definitely kick-started my project making. Spring does that to me every year. Am I the only one?